Is you is or is you aint a Fool?!? 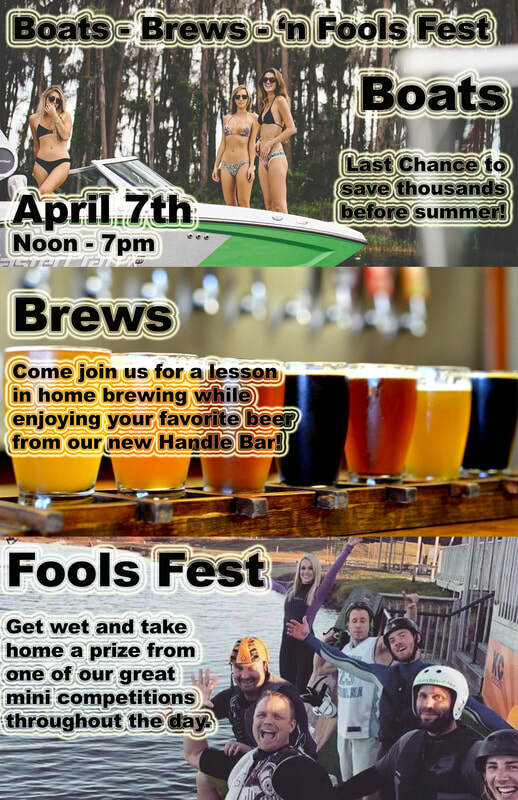 Come on out and join us for our annual season-opener event the Boats, Brews n’ Fool’s Fest (Formerly Fool's Fest). This year we are changing it up a little and hosting a home-brewing workshop while we shred it up! Come and learn how to craft your own beer for a “hop”-in’ good time. Also, we will have wakeboarding mini-games set-up, which includes the classic “best crash” award amongst others, as well as a toasty bonfire for those chilly hands and tootsies. Last chance to take advantage of preseason deals, huge discounts and incentives on all in-stock inventory! Some boats will be priced at or below dealer invoice. Be sure to stop by to take advantage of these insane markdowns. Ever wonder, "Hmm, I really like this beer stuff, but how the heck do I make it myself so I can get more of it?!" Well,we are partnering with beer-brewing experts Alex, John, and Jim to host a beer-brewing course just for you. Let me tell ya, these guys know beer. This is a unique opportunity for you and your buds to come out and drink a few brews whilst getting to make your own. That's right, if you sign up for the class, you get to test that tasty concoction that you help create with the class-perhaps even take some home with ya! Just call to reserve a spot. You read that right, a best joke contest. In the spirit of Fool's Fest, I want everyone to come out with their best one-liners to present towards the end of the day. You can feel free to dress-up like we have in the past as well! I (Colby) can't express how stoked I am for the joke competition. KC Watersports Fools Fest 2016 from Byron Clark on Vimeo.